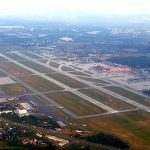 When a passenger aircraft heading for takeoff at Moscow’s Sheremetyevo Airport on Tuesday ran over and killed a man, apparently a passenger – the flight crew took off for Athens regardless. Now, questions are being asked. The airport’s public relations director, Anna Zakharenkova, outlined the fatal accident yesterday to Russian news agency TASS. The corpse has since been identified, Zakharenkova said, and police have been informed about the incident. The man “died instantly,” she added. The airport did not name the victim nor give any information about whether he was an airport employee or a passenger – but Russia’s Sputnik news outlet was more forthcoming, saying the plane involved was a Boeing 737 and giving other clues. Russian media is reporting that the man’s boarding pass was among the “personal belongings” scattered around the site of impact – indicating the deceased was a passenger. If so, what was he doing on the taxiway? Perhaps most alarmingly, Sputnik reported: “However, the crew decided to continue the flight, as the emergency equipment on the plane did not go off”. EARLY THIS MORNING, AUSTRALIAN TIME, the Moscow Times reported that the dead man was an Armenian citizen, in transit while being deported from Spain. It said authorities had obtained surveillance footage allegedly showing Albert Yepremyan, 25, breaking free and dashing onto the runway as passengers boarded the Boeing 737 aircraft. “The man went through the airport gate during boarding for a Moscow-Yerevan flight, went to the platform bus, but quickly headed toward the runway instead of getting in,” an official was quoted as saying. The identity of the aircraft that ran Yepremyan down remains a mystery. FlightAware.com sheds some light on it, indicating that the route from Moscow Sheremetyevo airport to Athens is flown nonstop by Russian carrier Aeroflot. That seems to be the only airline that does the route direct nonstop, so is the most likely suspect. According to FlightAware.com, Aeroflot alternates between a Boeing 737-800 and an Airbus A321 on the route. FINAL WORD on identifying the aircraft involved was supplied mid-morning by Simon Hradecky’s renowned and authoritative Aviation Herald. The publication named the aircraft involved as an Aeroflot Boeing 737-800, registration VP-BCG performing flight SU-2112 from Moscow Sheremetyevo to Athens. 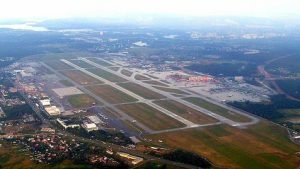 It said that during the initial climb out of Sheremetyevo’s runway 24L the crew reported they believed they had struck an animal on the runway. As there was no abnormal indication, the crew continued the flight to Athens. The Boeing 737-800 used by Aeroflot has a maximum takeoff weight of 79 tonnes.